Hakalau or Owl Eyes is a non-linear type of vision, a “soft focus” with the eyes that includes a specific awareness of the peripheral vision. In Hakalau one is attentive to something without focusing on it visually. In non-linear states of awareness the information we receive often comes in an indirect way. Sometimes it will appear to us as symbols within the mind’s eye or as memories. It can also appear as emotions or as physical sensations. we perceive from the very fringes of our sight. Peripheral vision is very important when we are gathering plants. When we bring our attention to our peripheral vision, we encourage our unconscious mind to help us in absorbing information from our environment. Hakalau means “recipient of the leaf” or “opening to the leaf”. 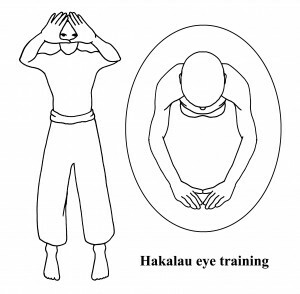 Hakalau is a traditional Hawaiian practice that uses the peripheral vision to connect with the environment. When I use the term Hakalau in this book I am widening its’ definition as a general term to include the practice of using the body, mind, and awareness to create sacred space around and within us. This sacred space is then used a platform from which to connect with our environment, but specifically to the plants in our environment. • Stand facing a plant or forest that is at least 20 feet away from you. • Bring your hands together at arms length in front of your face, creating a triangle shape with your thumb and index fingers. • Soft focus your eyes on something in the triangle created by your hands. •Soft focus your eyes on something in the triangle created by your hands. • Bring your external locus to your hands. What this means is that as your eyes are focused on the background, your attention, your external locus, is focused on your hands. • While keeping your distal soft focus drop your hands keeping your external locus whereyour hands were. In other words, your attention is brought to that which is not in visual focus. This is the core practice of eye training. This shifts our awareness and, in doing so, our state of mind. In Qigong there is a practice where we bring our fingers in front of his eyes but we focus on something in the distance. As we look at something in the distance our awareness remains fixed on our fingers and the optical illusion of the orbs that are floating between them. 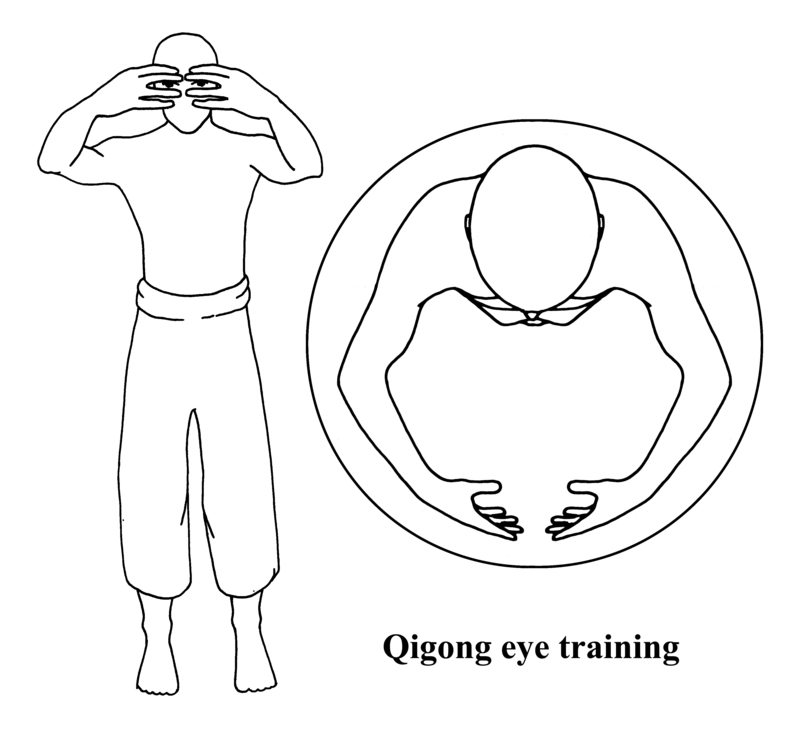 In Qigong the eyes are trained in a way very similar to Hakalau. The hands are placed in front of the eyes, with fingers parallel. The eyes focus on the hands, which makes the background blurry. The eyes then focus on the background, which makes the hands blurry, but also creates an optical illusion of two orbs floating between the fingers. • Stand you can see for more than 20 feet. You can either be outdoors or indoors looking out a window. • Bring your hands about 16 inches in front of your face with fingers apart as in the image above. Your arms should be in a relative circle, as if you were embracing a large ball or a tree. Keep your shoulders relaxed and forward. • Distal soft focus your eyes. • While keeping your eyes distally focused, bring your external locus to the optical illusion of the orbs created by your fingers “overlapping”. • Drop your hands, keeping your soft focus on the background and your external locus where your hands just were. Now we are ready to begin shifting our external locus to our peripheral vision. This is a technique used in deep listening and plant gathering. 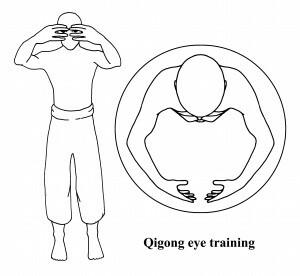 • Do either the Hakalau or the Qigong eye technique, bringing your external locus to your hands. • Drop your hands, and when you are ready, shift your external locus from where your hands were to your peripheral vision on both sides. We will learn to shift back and forth from an internal locus to an external locus. To begin shifting our internal locus to our peripheral vision. • Stand with your arms up in a Hakalau training stance. • Soft focus your eyes on something in the distance. • Bring your external locus to your hands, which are not in focus. • Drop your hands and keep your external locus on the place where your hands just were. • Bring your hands up in the same way, but this time make them 12 inches from your nose. • Bring your external locus to your hands, keeping your visual soft focus on at a distance. • Repeat this, bringing your external locus closer and closer to your nose. • Keep the soft focus of your eyes on the distance. After you have shifted your internal locus close to your nose, shift your external locus to an internal locus by bringing it inside your head. • When this becomes comfortable, begin to drop your internal locus toward your na’au, your lower abdomen. • Take note of any emotions or sensations this might bring up.